When Phil Christensen loads the OTES instrument into its secure shipping container, he admits he’ll have some mixed emotions. “It’s like having kids go off to college, you are very proud of them and you are happy. But it’s a sad moment,” Christensen said of sending OTES off to Colorado later this week, where it will be mated to its spacecraft. In September 2016, OTES (for OSIRIS-REx Thermal Emission Spectrometer) will take off from Cape Canaveral and head to the asteroid 101955 Bennu, a primitive rock that has undergone little change since it formed early in the solar system’s history. The goal of the OSIRIS-REx mission (short for Origins Spectral Interpretation Resource Identification Security Regolith Explorer) is to inspect Bennu and bring back a sample of it. OTES, one of six instruments on the OSIRIS-REx spacecraft, will play a key role in the mission. During its rendezvous, it will use long-wavelength infrared light to map the asteroid’s minerals, which will help mission scientists select where to collect the sample. The spacecraft will approach the asteroid and touch it briefly collecting at least 60 grams of dust, soil and rubble from its surface. It will return the sample to Earth via a separable return capsule and then be available to survey other asteroids, but not collect samples from them. Just as returning a sample from an asteroid is a first for NASA, OTES is a first for ASU. It is the first NASA-certified designed, built and tested instrument on the Tempe campus. All of the work on OTES was done in the cleanrooms on the first floor of ASU’s Interdisciplinary Science & Technology Building IV (ISTB4). 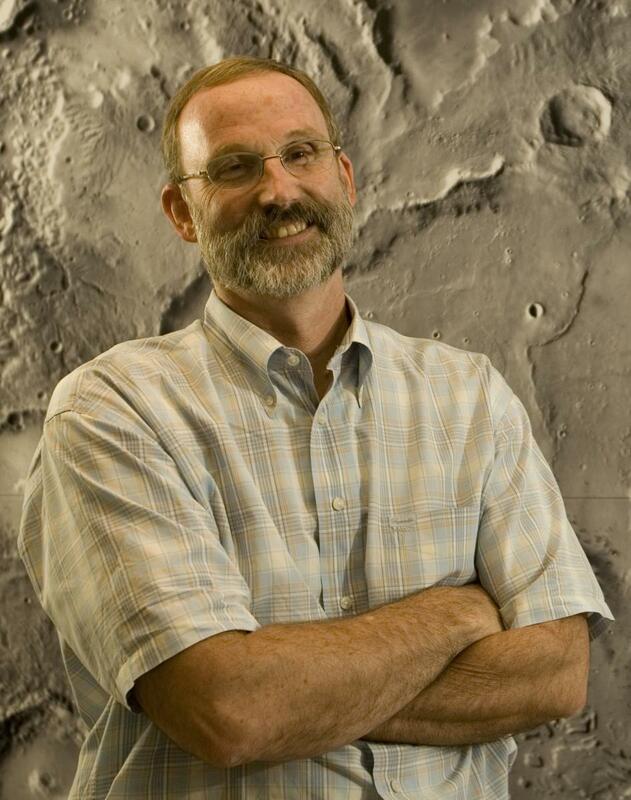 For Christensen, who has built five other instruments for NASA missions, OTES marks the beginning of an era for ASU, elevating the university to among a handful of universities that can perform these functions according to NASA guidelines. To build a NASA instrument at ASU first meant having to convince the space agency it could be done and done right. Being able to win over NASA’s confidence isn’t easy and cannot be understated, said Jim Bell, a professor in the School of Earth and Space Exploration. The opportunity to do so doesn’t come often. With five NASA instruments under his belt, all on schedule and under budget, Christensen said, he had a good reputation, but still needed to convince those at NASA that ASU was capable of doing the work. He did that by first explaining he was going to build, basically, the same instrument as last time. Christensen then hired several key people who actually built that instrument. As they were building OTES, he talked NASA into providing a thermal vacuum chamber in which the instrument could be tested in space-like conditions. That chamber now resides in a cleanroom in ISTB4. He is now negotiating with NASA to leave the test chamber for testing future ASU-built instruments and missions. Currently, the school’s faculty have submitted three proposals for full NASA Discovery missions. Each is for $450 million. Elkins-Tanton wants to send a mission to an all-metal asteroid called Psyche; Eric Asphaug, a professor is the School of Earth and Space Exploration, wants to do a cat scan of a comet nucleus; and Bell has a proposal in for a space telescope that would be parked near Earth’s moon and focused on the outer solar system. ASU also is involved in eight other Discovery mission proposals currently in to NASA, which will decide later this year which of the 28 total will receive funds for further study. Many of these proposals include provisions for instruments to be built and tested at ASU. The next instrument planned for construction at ASU is Christensen’s E-THEMIS instrument that will go to Europa, a moon orbiting Jupiter. NASA’s recently announced robotic mission will investigate whether conditions suitable for life exist at Europa, which appears to have a hard outer shell and is thought to have an enormous body of water under that shell. E-THEMIS (for Europa Thermal Emission Imaging System) will scan the surface of Europa at high resolution for warm spots, which could be places where the ice shell has become thin. Bell says he would like the Mastcam-Z camera for the Mars 2020 Rover tested in the thermal vacuum chamber at ISTB4. Christensen, Bell and Elkins-Tanton all point to ISTB4 as a big reason why ASU can now build these instruments on campus. The new lab space, the cleanrooms, the equipment and all of the amenities of the facility have contributed to the success of landing these instruments and missions. ASU Insight: A new transatlantic trade deal - Good for America? 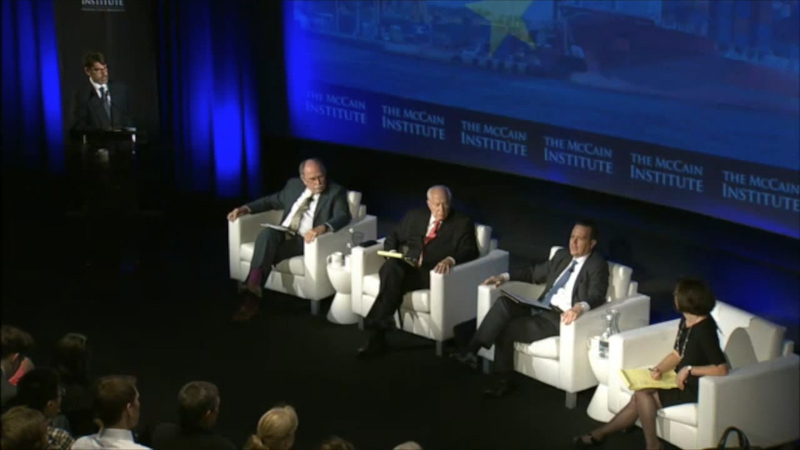 The McCain Institute for International Leadership at Arizona State University hosted the debate: “A New Transatlantic Trade Deal: Good for America?” at the Burke Theater at the Navy Memorial, in Washington, DC. The debate centered on the Transatlantic Trade and Investment Partnership (TTIP) between the United States and the European Union, and whether such an agreement would be positive for American jobs, growth, labor standards and the environment. Arguing in favor of an ambitious and comprehensive TTIP deal were Shaun Donnelly, Vice President of Investment and Financial Services at the United States Council for International Business (USCIB); and Jim Kolbe , former U.S. Congressman and Senior Transatlantic Fellow at the German Marshall Fund (GMF). Arguing against an ambitious and comprehensive TTIP deal were Ted Bromund, Senior Research Fellow at the Heritage Foundation; and Thea Lee , Deputy Chief of Staff, AFL-CIO. Jon Decker, White House Correspondent at Fox News Radio, moderated the debate. Europe is already our largest trading partner, with $6.5 trillion going back and forth in trade a year. A free trade agreement with the EU would boost U.S. exports to three billion dollars annually and increase the purchasing power of American families through cutting costs by $900 per year. TTIP is an opportunity for two big industrial democracies/economies to boost their competitiveness and set global rules through harmonizing regulations. Since EU and US standards are already high, these could, over time, also help set global norms for other countries such as China. TTIP is a way to kick-start the broader multilateral trade agenda that has been stalled in the WTO. TTIP would represent a new template for modern trade agreements. The economic benefits of TTIP are oversold; in reality, TTIP will only have a marginal economic impact. The main reason for this is trade barriers across the Atlantic are already very low. Most of the predicted benefits come from regulatory convergence rather than tariff reduction. Compared to previous trade agreements, TTIP is different in that its major impact is likely to be rules convergence rather than tariff reduction. While harmonizing rules could be useful for certain industries (such as pharmaceuticals and automobiles), for others it would only add new regulations, increasing costs for American manufacturers and consumers. Harmonization could also occur outside of TTIP and thus be more flexible down the road. To the extent that harmonization of regulations occurs through downward convergence, concerns were raised that TTIP could undermine essential consumer, labor and environmental protections. Thea Lee argued that the U.S. should drop the investor-state dispute settlement mechanism (ISDS) from the negotiation mandate because it is not necessary between two advanced economies such as the U.S. and the EU. The negotiators should also become more transparent and increase input from consumer, labor, and environmental groups on trade harmonization issues. Ted Bromund made the point that free trade already exists across the North Atlantic area. Rather than pursuing an ambitious and comprehensive TTIP, negotiators should focus on eliminating all remaining tariffs and quotas and agree to mutually recognized standards only when they make sense – not across the board. Rather than rules convergence, regulators should focus on de-regulation. Jim Kolbe said the most immediate action needed is for Congress to pass Trade Promotion Authority (TPA) so the President can proceed with concluding negotiations on TTIP. Shaun Donnelly called for Congress to pass TPA and then for the Administration to negotiate an ambitious TTIP agreement that would include the ISDS clause because investment is a key component of transatlantic commerce.